Mitchell's 308 Series Spinning reel is an extremely strong with it's advanced polymeric body and aluminum handle and spool. 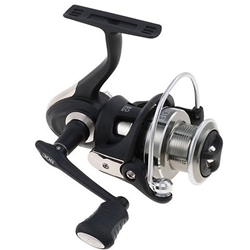 This reel has 8 bearings with an instant anti-reverse for smooth operation and an innovative bail halo. It has a 5.1:1 gear ratio and will hold 130 yards of 8lb test.